I got up and scanned my completed application form, so it's ready to send. Turns out it's easy to scan multiple pages into one document. I didn't know, I'd just never tried before. I went to yoga for the first time in a few days and it was just wonderful. I'm really sad that my Groupon is about to expire. I just can't afford their regular prices right now. Sad face. After yoga, I scooted over to Alex's, and from there we drove over to the Rebeccas' new house in the hills. They're in the process of painting, but it's already looking so good, and I'm ever so jealous of their amazing wall paper. We ate lunch in the yard with a sweet old dog named Suka standing by, hoping for some leavings of our Zankou Chicken. We chatted with them for a while, then shoved off to let them get back to nesting. I can't wait to see it when they're all moved in! Alex went off to pick up some film from a friend, and I went to Trader Joe's. I don't know why I can't just stick to my list when I go in there. All I needed was bread, almond butter, and milk, and I guess I needed avocados too, although they weren't on my list. Well, I got all those things, along with some delightful-looking blackberries and some bananas. Not so extravagant, but still about twice as much as I was planning on. Fat kid. The worst/best part is that those blackberries are going to be ice cream! I went home with my booty (think pirate, not badonkadonk), and used this window of time to make the clafoutis I've been threatening. Pitting cherries isn't the most fun thing in the world, but's it's not so bad, plus Julia Child says to leave the pits in, so I wasn't so particular about getting them all. Basically, if it didn't come out easy, I left it in. The recipe I was following (glutenfreegirl.com) called for 1/4 cup of amaranth flour and 1/4 cup of sweet rice flour. Since I had neither of these, I used almond meal (which makes more sense anyway) and oat flour. Now, Gluten free girl tripped me up a little with her instructions. She said the batter should resemble "Slightly thick pancake batter." Well mine was closer to milk. So I added some more almond meal. Still thin. Then a little more oat flour. There was this voice in my head that said, "Leave it alone," but I didn't. I added more until I had what looked like slightly thick pancake batter. Then I followed the rest of the directions, and stuck it in the oven. Now it said that it might need to bake up to an hour. When nowhere near that amount of time had passed, Alex called to say he was out front. Oh crap! It's 7 pm already? We were going to a screening at LACMA. My idea. Duh. I checked on the clafoutis, and miraculously, the toothpick came out clean. So I put it on the counter to cool, and rushed off. We got to LACMA with plenty of time, which is good because it took us a minute to find the theater. They started the movie late anyhow. No one in LA is ever on time. 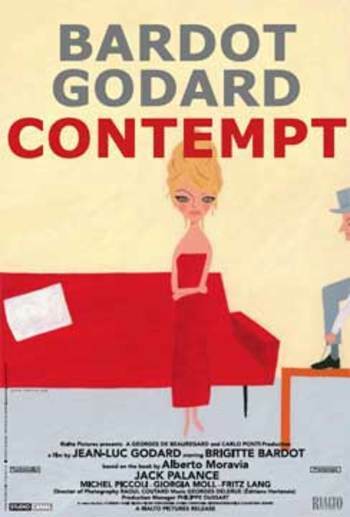 They're doing a series of French films on Fridays, so we saw "Contempt" with Brigitte Bardot, Jack Palance, and Fritz Lang, directed by Godard. I kind of hated it. It looked amazing, but it was a silly story with an incredibly repetitive script, and despicable characters. I definitely saw where Wes Anderson gets some of his style notes from. It was visually very cool. Still I was so relieved when it was over and we could go home and eat clafoutis. The clafoutis was more like a cake than a flan, but I think I owe the fact that it was able to bake all the way through before I had to leave to my little mistake. And it tasted great! Happy accidents, as they say.